The Chinese business concept of Guanxi can be translated to mean ‘networks,’ ‘connections’ or ‘relationships.’ However, these oversimplified terms mean that few people understand this fairly complex concept and the role it plays in the Chinese culture. The term can also be used to describe a businessperson’s network of contacts which they can call upon whenever they need something done. This network of contacts can also be used to exert influence to an individual’s benefit when needed. The type of networks espoused by this Chinese concept have a huge impact on how organizations conduct their business and can be linked to lean strategies, especially in the areas of growth and market expansion. The maintenance of ‘bureaucratic relationships’ can also assist businesses to set up shop in new markets with a minimum of delay. Still, the cultural differences in the western world of business understandably bring some challenges when trying to integrate Guanxi within corporate practices. General knowledge of Chinese culture: It helps build relationships if you have some knowledge of the country and its cultural norms. Also, having an understanding of your contact’s business helps. Formal introduction: Since the Chinese prefer to conduct their business with individuals they connect with personally, it helps to be introduced to a prospect by an intermediary. It is even better if the intermediary has a relatively high social status. Conscious effort: Business relationships among the Chinese are more trust-oriented than those you will find elsewhere. It therefore requires you to make a conscious effort to nurture that trust. For this reason, it is necessary to communicate on a nearly daily basis and carry out plenty of socializing. Gifts: The giving of gifts is an important aspect of Guanxi. Gifts that reflect your own culture or have your company logo are likely to be particularly well-received. Dining and entertainment: When you have established contacts in China and gained their trust, you are likely to get invited to dinner or to attend some other form of entertainment. What is important is to always arrive on time, be respectful and take gifts that you may be offered. In business, Guanxi is one of the concepts that are used to optimize value for the enterprise. In the Lean methodology, enterprise value optimization equates to value stream optimization. From the point of view of an organization using lean, value stream optimization as envisioned through Guanxi ensures that relationships between the core elements of a company – both internal and external – are optimized and working towards the common goal. Getting the principles of Guanxi right means the establishment and optimization of the relationships between the internal core functions (employees, managers, processes, infrastructure and systems), the environmental core (customers, stakeholders, regulators and partners) and directional core (strategy, vision, mission and values). All of these relationships need to be structured in a way that optimizes the performance of the organization. Building up of beneficial relationships will result in efficiency and optimization of a company’s value streams and supply chain. On the face of it, gaining these networks may seem like a difficult and daunting task, but it is the ideal that any lean organization should work towards. Often, business leaders get disappointed when they are introduced to important contacts and a relationship does not immediately take off. However, patience and perseverance is necessary when targeting decision makers and influencers when looking to scale up a business. This is because they form the networks that are vital to opening up new opportunities and markets. Nurturing strong business links within the lean framework is especially vital for startups, and business leaders need to understand that gaining the trust of highly influential contacts takes time and work. 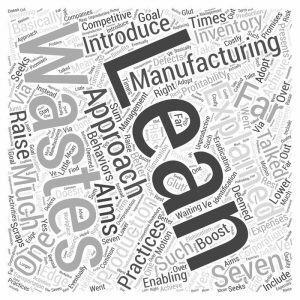 The post The Impact of Guanxi on Lean Practices appeared first on Shmula. How Much of a Company’s Daily Time Should Be Dedicated to Improvement Discussions?